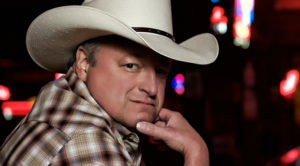 A Beaumont, Texas native, singer-guitarist Mark Chesnutt delivered his first hit back in 1990 with “Too Cold At Home.” Produced by longtime friend and collaborator Jimmy Ritchey, his new album, Tradition Lives, sounds like a throwback to the country music of the ‘80s. When Chesnutt started out, he befriended George Jones, Merle Haggard and Waylon Jennings, all of whom he cites as influences. He phoned us from his Texas home where he was taking a break after a two-week run and planning to do a little fishing. Growing up in Texas, you must’ve been exposed to traditional country from an early age. Music was always playing at our house. My mom and daddy would play the Hank Williams records. He would get his guitar out and sing for company. He was always singing. My momma would be playing Elvis Presley, Fats Domino, Jerry Lee Lewis and all the old rock stuff. My brother was five years older than me and he always playing the ‘70s rock bands like ZZ Top and Aerosmith. I was soaking all that up. I think your dad helped jumpstart your career, right? He tried to get into the music business and wanted to be a songwriter. He did a lot of demos. He used to go to Nashville, and had some things working for him. He couldn’t move there because he already had a family. He had a wife and kids and he couldn’t pull up stakes. After several years, he gave it up, but he learned a lot just from hanging out with those people. I made it sound like he only fooled with it for a couple of years, but he was doing it for a good 10 to 12 years. When I decided I wanted to be a country singer, I wanted to play guitar and sing. I was playing the drums in a rock band but I wanted to be a country singer. He taught me how to play his acoustic guitar and took me around to where all the musicians he knew were playing in the honkytonks. He got me to sit in with them and starting singing with those guys. He brought me up to Nashville to meet the people he knew. I took it over once I got old enough to do it on my own. I started singing around here and driving myself to Nashville. I made a couple of trips a year, but I never moved up there but always stayed here in Beaumont. That’s what led to where I am now. I just stayed after it and met songwriters who would give me songs and a couple of them were “Too Cold at Home” and “Old Country,” and they led to a record deal. All the while, I was coming home and making records here for a couple of labels here in Houston and San Antonio. Your major label debut, Too Cold at Home, became a hit. What was that experience like? Once I got a record deal with MCA, I felt like I had made it and all the struggling was over, but that’s not the way it works. That was just my start and then the work started. It was no longer a fun hobby. It turned into a business. Then, it got crazy and it still is. Twenty six years later, I’m still out here doing it and making new music. It’s been very strange. When you put it all together, it’s been 36 years altogether with all the stuff I did locally before I had a record deal. Did you get a sense that styles were shifting? I got caught up in the middle of it. I was warned it was going to happen and that radio was going to change and the whole thing would be shook up. I didn’t know what to expect, but it got weird and it keeps getting weirder all the time. That’s what happens. When I started recording in 1989 and when I met heroes of mine like George Jones and Merle Haggard, they were saying things about how things had changed and country radio wouldn’t play their stuff anymore. It was harder and harder for my heroes to get played. The same thing happened to my generation. Ten years later, we were saying the same thing. It’s always a cycle and that’s never going to change. That’s just part of it. Did you intend for Tradition Lives to evoke old school country music? I’ve never changed my direction. I stayed on the traditional side. That led to me leaving MCA and then Sony. The reason I left the major labels was because I wouldn’t conform and do the type of music they wanted me to do. I wanted to stick with country . . . traditional country. I ended up on my own doing independent stuff. When we finally had the opportunity and my producer started his own label — I had worked with Jimmy Ritchey for several years on everything I recorded for independent labels – we always made traditional country records. We had the opportunity to make a new album after a lot of years and we wanted it to be the best album we’d ever done. We didn’t know for sure if I’d get a chance to record again. I wasn’t trying to get on radio. We knew our chances for that were slim to none. We wanted to make an album for my fans who had been asking for new music for a long time. That was the whole purpose of this album. We found some great songs, and it got a lot of attention when it was released. A whole lot of people took notice. It made more noise than we intended to. It was reviewed by Rolling Stone and major publications that never really cared about anything I’ve done since my major days. With the song “They’ve Never Been to Texas,” you take a shot at fair weather country music fans. What inspired the song? This was a song that was written way back in the ‘90s when country was leaning more toward a pop sound. It wasn’t the first time. Country did the same thing in the ‘80s. It got real slick and polished. We saw these people running the labels and working as consultants for the radio stations. They don’t know that this lifestyle still exists real strong all over the country. Some of those people never get out of Nashville or New York or Los Angeles. Some have never been to small town Texas and seen honkytonks are still going like they always have been. We weren’t trying to knock anybody. We were just picking at them. We were just poking fun. What made you want to cover Gary Allan’s “I’ve Got a Quarter in My Pocket”? When the guy who wrote that song, he goes by Jake Kelly. He played guitar with Gary back in the ’90s. Jake told me he wanted me to cut that song. He said he wrote that song with me in mind. I told him that one of these days I would. Gary’s version isn’t a Texas shuffle all the way through. I got ahold of Jake and told him I cut it. He was happy. He said that’s how he always heard that song. He was glad that a Texas guy finally cut it. “Look at Me Now” is my favorite tune. What’s the story behind that song? That’s just one of those songs. I was pitched thousands of songs. I didn’t think I would get anything pitched to me. When I put out a notice, I said I wanted real country songs and no pop or dirtroad country. I didn’t want anything that was played on the radio. I wanted something that was just country. I started getting thousands of songs. I just thought the song was a funny. That one was pitched to me I don’t know how long ago. It was written at least 15 years ago. It bounced around and I had it for several years. When it showed up again, I wanted to cut it. A lot of these songs, I had heard before. They were pitched to me in the past but I didn’t record them because I ante to be played on the radio. This time, I didn’t shoot for airplay. I wanted to make a good album for my fans. That’s why I did songs like that. I knew “Hot” would never get played. I had creative freedom and nobody was telling me what not to do. We had a great time recording it. I had more fun doing this album than I ever have in my life on any other album. That’s why it took two years. Have you started to think about the next album? I’ve gotten probably 20 songs already in my mind for the next album if I ever get another shot at one. This company, like all the other indie labels, eventually runs out of gas. That’s what happened with this one. I can’t say the label is shut down but they’re not doing anything right now. Mine is the only thing going on right now. Wherever we land, I’m sure I’ll be in the studio again or doing it myself. I have several live albums and greatest hits things that I have done myself on my own label.